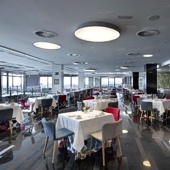 The Parador of Cadiz reopened in September 2012 after being totally rebuilt. 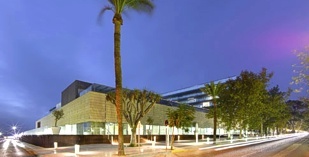 This new building presents a modern, updated architecture, in which light, space and noble materials are key elements. Its new architecture blends the most diverse shapes and materials such as wood, marble, steel, stone and glass giving the building a contemporary look. The Parador is located in the historical centre of Cadiz, between La Caleta beach and the Genoves Park. 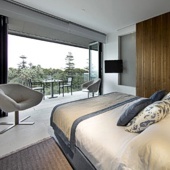 The Cadiz Parador has one hundred and four bedrooms including eighteen double bedrooms and eighteen junior suites, all equipped with mini bar, safe and hair dryer. Bedrooms are modern and beautifully decorated. Some have impressive terraces overlooking the ocean and the town of Cadiz. As with all hotels in the Parador group, the restaurant specialises in the local dishes and it also has a gluten free menu. It is said that Cadiz was founded over 3000 years ago by Hercules while resting from his labours. Its inhabitants gained great wealth when it became the major port of Spain for the trade with the colonies in Latin America. Relics of these prosperous times can be found in the city museum together with the more troubled times of the Napoleonic Wars. Other interesting places to visit in the old area of the town include the walls and fortresses of Puertas Tierra, the Baroque style cathedral, the archaeological museum with its collection of Phoenician sarcophagi, and the San Carmen hospital which has a Greco picture. Also worth visiting is the Horse Fair held in May in Jerez. Whilst there, taste the sherry in its birthplace and also see flamenco dancing. It is a convenient spot for those wanting to visit the inland 'white villages' the caves or the mountains. Also worth a visit is the British enclave of Gibraltar although border restriction often result in long delays. Parador facilities include bar and restaurant, heating, lift, free wireless Internet, parking facilities (without security and limited places), garden, spa and a seasonal swimming pool. The Parador Cadiz also has wide meeting rooms for all kinds of celebrations and events. Distance from the nearest airport is approximately 45 kms, the nearest train station is 2 kms away and the nearest port is approximately 1,5 kms away. Pets are not allowed the hotel. We waren idn Cadiz begin juni.Vanaf de receptie was alles naar wens ; Een van de betere paradores op onze rondreis. Een echte aanrader voor alle Spanje bezoekers. We had an absolutely fantastic stay at the Parador. It was the first time that I had stayed in this chain of hotels. We were treated very well (even a free spa package, chocolates and a drink on our arrival). The facilities were excellent - beautiful pool and resturant. The city itself is so interesting to walk around and discover. We only ate in the hotel restaurant for breakfast as there are so many local restaurants around with tapas and fresh fish dishes. I will definately be coming again. Spent a couple of nights here at the begining of January and had a wonderful time. The modern decor is impressive and the facilities were excellent. Good sea views, easy to walk into the town and the secure garage parking a real bonus in a hotel located in a city. We also liked the spa and indoor pool arrangement. Will definately be back! 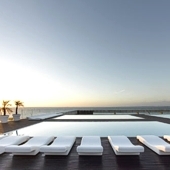 A luxury modern Parador hotel near Cadiz in Andalucia southern Spain.